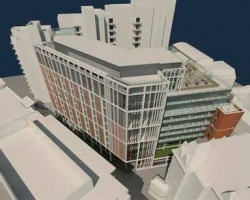 A large mixed-use scheme known as Central Square is the latest project to highlight the strengthening Leeds property market. A stone’s throw from Leeds railway station, a new mixed-use scheme, known as Central Square, has risen up on the plot previously earmarked for the Lumiere, a 54-storey tower that would have been the tallest residential building in the UK outside of the capital. The Lumiere project went into liquidation in 2010 after banks stopped property lending. Now the steel frame of the multi-million pound Central Square has risen up on the site and is set to breathe new life into an area benefiting from the upturn in the city’s commercial property sector. “The cranes that currently dot Leeds city centre’s skyline are a marker of the growing investment and confidence in the commercial market, a resurgence that is also creating a strengthening upward curve in the construction industry,” says Wates Construction North Managing Director Phil Harrison. Central Square is strategically situated between Whitehall Road and Wellington Street with a high profile presence. It is a 20,400m2 development, which provides 18,700m2 of Grade A offices with 1,700m2 of retail, leisure and health/fitness. 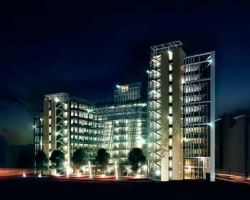 The scheme provides office accommodation on 10 floor levels. The offices are said to provide the largest floorplates available in the city and are also arranged so that they can be subdivided, providing the occupier with both flexible and highly efficient floor space. Occupiers will also benefit from an outdoor sky garden on the ninth floor, providing entertainment opportunities and views across the city. Sitting above a two-level concrete basement, the steel frame forms a U-shaped structure with the central void occupied by a fully glazed winter garden. This prominent glazed feature of the scheme will accommodate numerous retail and leisure opportunities in the form of bars and restaurants, together with a gym, at first floor and ground levels for the benefit of the tenants and general public. The glazing for the winter garden slopes down from the underside of level eight within the central portion of the structure. Five 27m-long bowstring trusses, that were delivered to site in two pieces, form this indoor zone. “There are heavy loadings on the trusses and so they are pin connected to one tonne bases a ground level,” says Elland Steel Structures Site Manager Mark Wingrove. These trusses were the longest elements to be erected by Elland, but because of their position they were some the final bits of steel to be erected, as steelwork had to be erected above level eight before the trusses could be installed. The largest steel element on the job is a 43t, storey-high, Vierendeel truss that supports level eight’s balcony that overlooks the winter garden. The Vierendeel truss was brought to site in individual sections that were then assembled on the ground before being lifted into place by a 300t capacity mobile crane. 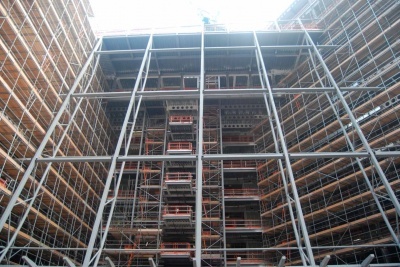 The majority of the steelwork was erected using the site’s tower cranes, with Elland employing two erection gangs that divided the structure in half and erected the frame three floors at time. Each of the U-shaped structure’s tips contains one of the building’s three cores and this gave each erection gang an ideal point to start. From the stability-giving outer cores each of Elland’s erection gangs worked their way to the centre of the structure, meeting up at the third centrally positioned core. Above the lower levels of retail and leisure, the offices begin at floor two and extend upwards to level 12. Floors two up to seven are identical, with a central portion positioned inside the winter garden. The reception for the offices is positioned at first floor level and accessed via a feature escalator, with the upper floors being accessed by a number of lifts including two glass-clad wall climber lifts, which overlook the Winter Garden. Floor eight features a large balcony overlooking the winter garden and is the last full office floorplate within the development. 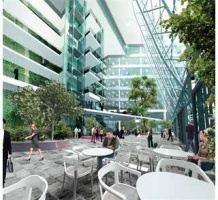 Offices occupy the eastern half of the building on the floor above, while the other half is occupied by the outdoor sky garden. From here upwards, the three topmost levels (10, 11 and 12) only occupy the eastern half of the structure. 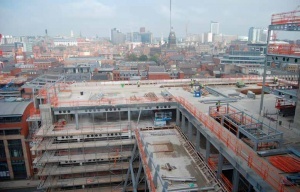 Central Square is aiming for a BREEAM ‘Outstanding’ rating and is due to be completed in May 2016. Collaborative 3D modelling has been utilised from feasibility and planning stages through to construction on Central Square. DLA Design says it was essential that all disciplines in the design team used compatible 3D modelling packages, and in turn developed models to a required level of detail for each building element. The site had been previously partially developed (ahead of the Lumiere project) and an extensive network of piled foundations existed at basement level. It is here the proposed building sits. It was important that the structural engineers modelled existing features, which enabled coordination of the architectural model with the existing site constraints. The implementation of BIM has enabled the creation of life-like 3D animations for client presentations, engaging with them and potential tenants, whilst providing realistic representations of the end building image throughout the design development stages. During the detailed design and construction stages, the individual discipline building models are shared on a regular basis. Meetings are also undertaken to review the federated models in Navisworks, evaluating the degree of coordination achieved at regular intervals throughout the project. This level of coordination leads to the ability to review a virtual building model when specialist subcontractors are on board for on-site installations, which enhances site coordination through to the fabrication of elements.